LONG TIME NO BLOG!!! I'm so sorry I've been so incredibly busy at the hospital and studying plus I haven't really known what I could even blog about for you guys (suggestions are open). But considering I'm on my LAST CORE ROTATION OF THIRD YEAR... where has the time gone?! I thought I'd compile what I used to study for each core. Now this is what worked for me and how I study best (visual learning and lots of repetition). I used Online Med Ed across the board for all of my cores. I found it isn't as detailed as what NBME's are but it is an amazing summary of topics so I'd try to watch those videos in the first week to get a good foundation for my core. UTILIZE THE NBME's!!!! Those were great learning resources. Again I used those for every core - I'd spread them out throughout the core and take a day going through the questions afterward. If there's anything else you want me to write about please let me know! First of all just wanted to wish a HAPPY CANADIAN THANKSGIVING TO ALL MY CANADIAN FRIENDS AND FAMILY! Secondly, sorry I've kind of fallen off the blogging bandwagon for the last while! Third year is no joke - work and studying never seem to end and the responsibility of being in the hospital and on your "A game" is tough. I can feel the burnout hitting as I've been studying since March with only a weekend between core rotations as a break. After being stressed myself and seeing several other friends posting about Mental Health and Awareness I wanted to add my two cents into this discussion. In my personal opinion, even though it is the most important, mental health always falls to the back burner of every students mind. Generally you don't realize you haven't been taking care of your own mental health until later on and you find yourself in your apartment or in the hospital on the verge of a breakdown. You feel like you cant do anything right - can't answer questions properly, can't suture, tie knots, write a proper note, do a proper history and physical... the list can go on forever. "Can I even do this? Will I pass this shelf? Am I going to make it through third year let alone Step 2 CS/CK? Will I even get a residency? How am I going to pay for all this debt I'm in?" This list can also go on for miles and can be applicable to any stage of medical training you're in. 9 times out of 10 THAT is when we realize we haven't taken care of ourselves. Haven't eaten properly, haven't seen anything other than the inside of the hospital and our apartment, have barely slept and don't even know what self-care is at that point. Although it seems counter-intuitive taking a little bit of time out daily or weekly to do something for yourself can help tremendously with your productivity and attention. I'm currently in OBGYN (delivering babies) and in my first rotation where we have 24 hour calls. So figuring out how to balance school with keeping myself sane has been difficult. I notice when I'm not taking care of myself I can't focus to save my life - let alone study. It's been a journey each rotation to figure out how best I work so I can balance studying, the hospital and my personal sanity. After OBGYN I head into Surgery where I'll spend 7 weeks in Trauma Surgery and 5 weeks in subspecialties. Then into my final rotation of third year Internal Medicine! Even though I've had my fair share of, "Can I do this?" moments I wouldn't trade 3rd year and my experiences for anything. I've been thoroughly enjoying NYC when I do get the chance to explore and the people I have met through the hospital. I'm halfway done my Pediatrics rotation and am currently in the NICU (neonatal intensive care unit) part of my rotation. The attendings I've been working with are so incredibly knowledgable and patient with me while I try to learn about Neonates. I started noticing myself playing the dreadful "what if" game again with myself. I started comparing my journey and experience with others - and I thought to myself "Okay, if I'm doing this I'm sure others are as well" so here I am writing a blog post about it! FIRST OF ALL, if you are reading this and you are in the medical field I wanted to say congratulations to you for choosing this path. From my very limited experience it is very rewarding but also extremely challenging. And no matter what part of your journey you are on I applaud you. Now for some feelings I have directly towards my peers in MS3 - I know we spend all day with one another in the same hospital but in different rotations. I can almost guarantee we've all had the thought "I wish my rotation schedule was more like ____" or "I wish I had _______ attending". I'd be lying if I said those thoughts never crossed my mind, they have, and I'll be the first to admit it. After several different discussions I've had in the hospital with patients, nurses, residents, attendings and other students I've started to realize how thankful and lucky I am to even be on this journey. Not everyone is lucky enough to go to undergrad, get accepted to MERP, get accepted to medical school, go to medical school on a foreign island, (this felt weird to type) be fortunate enough to even write step one, rotate in a hospital, match into a program and eventually become an attending. Some people may dream of it but are unable to attain it for whatever reason. Coming to the realization that I am lucky to be able to wake up early in the morning to go to the hospital to learn and then come home tired but still push through and study for upcoming exams has really helped my fatigued brain. Suddenly when I've started just being thankful for being in medicine the comparisons I'd been making previously stopped - and I just wanted to experience the rotation in whatever order it had been given to me. ANYWAYS, I need to stop procrastinating and start going through UWorld again. I just finished my family medicine rotation! To say I enjoyed it would be an understatement. I’ve known I belong in primary care for a long time. I’ve always enjoyed sitting with people and learning more about them and how I could help them. After going through this rotation I’ve grown to appreciate and respect the job of a primary care doctor more than I ever did before. They can be a patients voice, their shoulder to cry on, their sounding board, their confidant, a friendly face, the only stable portion of a persons life and so much more. The role of a general practitioner has been made to be someone who just writes referrals out and moves onto another patient. After this rotation I can assure you they are so much more than that. I’ve had the opportunity to work with some of the most amazing doctors who love and care for their patients more than I can begin to describe. They came in every day with a smile on their face ready to absorb any pain or suffering their patients were going through. They guided their patients through the medical system, trying to make sense of the complexities of it. I’ve honestly loved working with the patient population I’ve seen at my clinics and within the hospital. I have learned so much in a few short 6 weeks - I’m excited to see what I will continue to learn and grow through during my next rotation. As I’m sure you’ve all seen through my blog so far - Medicine is tough. I’ve only known the academic aspect of it and boy that was something. Being on the other side and learning about the clinical side of medicine makes me realize how seemingly “easy” the academics were. The learning curve is steep - trying to grab my book knowledge, multiple choice question answering brain and let it grow to allow me to see the diseases and pathology in front of me (still trying to figure it out). All while trying to learn a new location, with new people a WHOLE new environment. I’d be lying if I said it was easy. I thought, “How am I going to make it through this?” multiple times a day. Guys, somehow... even when you think you can’t make it through it, you always do. I'm sitting here writing this and I should be going to bed but I can't help but think. Think about MERP in August 2015 then moving to Dominica January 2016 then coming home April 2017 and finally being in IMF. It's only been 2.5 almost 3 years but I feel like I've lived a lifetime. It's been so rewarding, frustrating, exciting and nerve-racking and I can't even begin to try to put it into words. I always end up writing these blogs when I need to hear what I'm writing in these blogs the most. I think to myself - if I need to hear this I can only imagine others do too. I've been thinking lately about this journey... specifically my journey but I want to include everyone on this journey. I always go back and forth in my mind about sharing my journey and being public about it because I never want someone to compare their journey with mine. Because I know I do that. So it got me to thinking... write a blog about it. I've heard the line (and thought the line) "well ______ is going through ______ so I can't complain". But when I take a step back and really think about when I say something like that I'm really putting my own personal struggles and hardships down. EVERYONE... let me say this again EVERYONE is going through their own struggles. Whether it's personal or family oriented, seemingly big or seemingly small, within your control or not. We all have things we need to deal with and none of that should ever be compared. No one should ever be little their own struggles because it seems like it's not a big deal. It's important enough for you to think about - therefore it's a big deal... to YOU. The beauty of medicine and its journey is that everyone is going to experience it very differently. We're all going to have different paths yet we all want the same thing... that MD/DO behind our names. Some students struggles may be internal - whether it be imposter syndrome, test anxiety, lack of confidence. Or external - family, friends, personal illness. Maybe some students deal with all of the above. My point is your journey is your journey - however bumpy or smooth, internal or external. It's yours. And you should be proud of your journey. No matter how far along your journey you are. You could be in clinical rotations, basic sciences, just getting into med school, studying for your MCAT or just starting your pre-med journey. Be proud of where you are and what you've accomplished up to this point. Never focus on someone else's road. Be proud of you. I had been planning on blogging once I settled in here but that hasn't happened yet. It's a VERY DIFFERENT busy than studying for boards. I feel like I'm constantly on the move and quite honestly I've been finding it difficult to get into a rhythm. I'm normally the kind of person who can get into a schedule pretty quickly but with our continuously changing schedule that's been pretty tough for me here. Basically my week looks like 2 days in the clinic interviewing and doing physical exams on patients, 2 days on campus for simulations, OSCES, and skills labs and one day of lectures. This past weekend we were trained in ACLS (advanced cardiac life support) and BLS (basic life support) and this coming weekend we have PALS (Pediatric advanced life support). I'LL BE IN NEW YORK! I was hoping to not have to deal with another winter (I am not a fan) BUT I am excited to be close to home again and be able to experience the city! I'll be starting my cores with Family Medicine so I am a little nervous since I've been told that's the most difficult shelf exam but I'm trying to keep an open mind. Although starting in the hospitals means beginning a brand new learning curve, I am excited to begin and do what every medical student went into medicine for - to help patients. 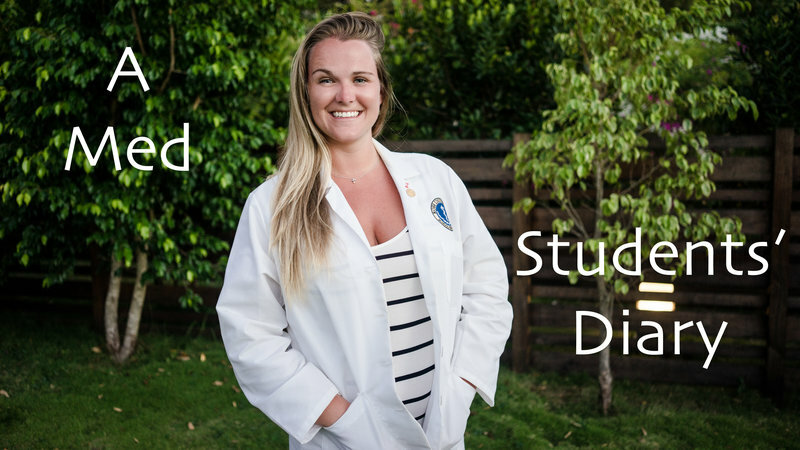 With beginning a brand new part of my medical school journey the dreaded imposter syndrome has been sneaking up on me again - wondering if I'm actually good enough for this, whether medicine is right for me, am I even smart enough to be going into clinicals? Any time you feel the most uncomfortable and the most nervous you're about to have the most personal growth. Looking back I was SO SCARED to go to medical school in Dominica but I can say with 100% certainty I would not be even close to the person I am today without all of the experiences I had on the island. Long time no post!!! I've been waiting to post and finally share that I have closed the door on MS2 and am moving forward to MS3! I think this is the year that all medical students dream about. Finally getting into the hospital, being done with Step One, interacting with real patients with real problems and really diving into medicine. Since writing Step I've been running around trying to get my life organized and finish all of my pre hospital health check ups along with organizing my life into two suitcases before I head off to IMF. I've slowly been updating my professional attire since, let's be real, I've been living in leggings and tank tops for the past year. What is IMF you may be wondering? Well my school has a six week program called the Internal Medicine Foundations that we must complete before starting our core rotations. The simplest explanation is it's a pre-clinical bootcamp... we get to work on and perfect our patient encounters, practical skills (scrubbing in, IV lines, physical exams), SOAP (Subjective, Objective, Assessment, Plan) notes and History and Physical Exam notes. Even though I haven't started yet, I am very thankful that my school has this since it allows us to brush up our skills before we're in the hospital on our rotations (I know my first few interviews/physical exams aren't going to be the smoothest). After six weeks of IMF we begin our core rotations (one year) which consist of Family Medicine, Surgery, Internal Medicine, Ob/Gyn, Pediatrics and Psychiatry. Also, I've been looking at all of the different resources available for core rotations and it's been VERY overwhelming! I'm planning on keeping you all updated throughout this part of my medical journey as well - what resources I've used and my experiences along the way. If there's anything in particular you want me to write about please let me know. AND THANK YOU, FROM THE BOTTOM OF MY HEART, for joining me on this journey.